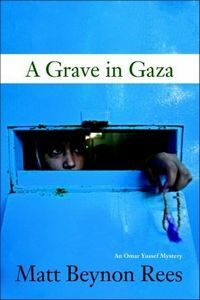 A Grave in Gaza by Matt Beynon Rees, a Mysterious Review. Review: Palestinian school teacher Omar Yussef travels with a UN contingent to the Gaza Strip to investigate the imprisonment of a university professor and finds far more than he bargained for in A Grave in Gaza, the second mystery in this series by Matt Beynon Rees. Eyad Masharawi has been arrested for questioning how some officials in the Palestinian government in Gaza obtained their university degrees. In addition to his duties to the university, Eyad Masharawi is also on the payroll of the United Nations, three representatives of which are sent to Gaza to protest his arrest. Omar Yussef is one of these UN officials; the other two are James Cree, a Scotsman, and Magnus Wallender, a Swede. But soon after meeting with the commander of the security force holding Eyad Masharawi, Colonel Mahmoud al-Fara, Wallender is kidnapped and held for ransom in exchange for prisoner being held by a competing government faction in Gaza. One event doesn't seem to have anything to do with the other, but Omar Yussef is determined to free his academic colleague and pursues an investigation that ultimately proves to be fatal to many of the people involved. A Grave in Gaza is a remarkable book. It's not a murder mystery or a whodunit, but an elaborate puzzle with clues to its solution scattered up and down the Gaza Strip. A common theme here is that all crimes in Gaza are connected, and it is up to Omar Yussef to arrange the pieces of these disparate events to form a clear picture of not what has happened, that he already knows, but why it happened. The author uses dust as a metaphor in the story (a bit to excess, but that's a minor quibble). As the dust storms intensify, reducing visibility, so too is Omar Yussef's investigation clouded. The lack of clarity is pervasive. The layers of dust that accumulate on everyone and everything are symbolic of the layers of crime, corruption, and greed that seem to be suffocating this small territory. It is only when the puzzle is complete and the pieces fit perfectly together do the skies brighten and the dust storms abate. Rees wisely leaves (for the most part) the macro politics of the region out of the story, focusing on the local politics of the Gaza Strip, incorporating them seamlessly into the plot. There's a different definition of normalcy here that some readers will likely find shocking and disturbing. Acknowledgment: Soho Press provided an ARC of A Grave in Gaza for this review.